“Film Music Vol. IV.” Alfred SCHNITTKE: Sport, Sport, Sport (1970, arr. Frank Strobel); Die Abenteuer eines Zahnarztes (1977, arr. Frank Strobel). Rundfunk-SinfonieOrchester Berlin, Frank Strobel (cond.). Capriccio 5002 (1 SACD) (http://www.capriccio.at/). Distributed in the US by Naxos (http://www.naxos.com/). These two scores for films by Elem Klimov are wonderful discoveries. I now have to hunt down the series’ first three volumes, good medicine after the bewildering Ninth. 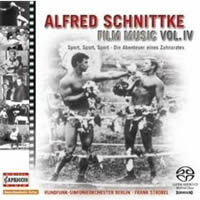 Sport, Sport, Sport demonstrates unequivocally that Schnittke was a master of genre and orchestration. “The adventures of a dentist” is tamer. Both scores run rampant over moods and styles, and some may find the electric guitars and Esquivel-like flourishes a bit campy. Sport, Sport, Sport moves effortlessly between other movie scores, Ellingtonian big-band, Haydn and Grieg. One cue explicitly quotes Tchaikovsky and Francis Lai (A Man and a Woman). After these films were banned, Schnittke fashioned his Suite in the old style for violin and piano collecting bits from both scores. 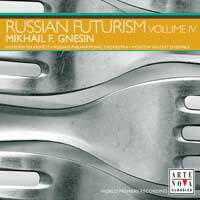 “Russian Futurism Vol. II.” Alexander GOEDICKE: Ouverture dramatique pour Grand Orchestre, Op. 7; At War (From the Diary of a Dead Soldier), Op. 26; Horn Concerto, Op. 40 (1929); Trumpet Concerto, Op. 41 (1930). Gleb Karpushkin (hrn), Vladimir Gontcharov (tpt), Russian Philharmonic Orchestra, Konstantin Krimets (cond.). Arte Nova ANO 390481 (http://www.allegro-music.com/artenova/). “Russian Futurism Vol. IV.” Mikhail F. GNESIN: “D’après Shelley” Symphonic Fragment, Op. 4 (1908); Requiem, Op. 11 (1914)*; Piano Trio, Op. 63 (1943)*; Songs of a Knight Errant, Op. 28 (1917)*; Adïgeya, Op. 48 (1933)*; The Jewish Orchestra at the Ball at Nothingtown, Op. 41 (1926). Moscow Soloist Ensemble*, Russian Philharmonic Orchestra, Konstantin Krimets (cond.). Arte Nova ANO 487221 (http://www.allegro-music.com/artenova/). Allegro Music has bundled five discs of Russian Futurism together as Arte Nova ANO 487230 with contrasting compositions by Alexander Mosolov, Alexander Goedicke, Julian Krein, Mikhail Gnesin, Georg Kirkor, Nikolai Roslavets and Lev Knipper. I’ve always assumed that Russian Futurism would resemble Mosolov’s Iron Foundry. These scores’ stylistic inconsistencies contradict that notion. Not much here sounds reflective of industry. Vol. II presents four orchestral works of Alexander Goedicke, known in his day as an organist and Bach scholar. Two pieces aren’t given dates. The notes place them between 1915 and 1930. Just how Goedicke’s late-Romantic style shelters underneath the Futurist umbrella perplexes. While the notes characterize Russian Futurism as “unaffected, genuine and at the same time elemental, reflecting the sounds of everyday life,” his music doesn’t bear this out. The Ouverture dramatique pour Grand Orchestre lives on the line that connects Tchaikovsky’s Hamlet with Rimsky-Korsakov’s Russian Easter Overture and Shostakovich’s Festive Overture. An uninformed listener would think a German composer wrote At War, “Six Improvisations for Orchestra.” The Horn Concerto folds Straussian bravado with gentle neo-classicism. Known to generations of brass players, the Trumpet Concerto nuzzles an idealized naturalism. Its happy Poulenc-Mozart coda will startle. 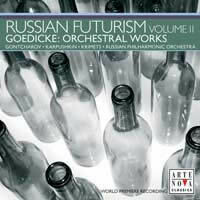 In terms of Futurism, the concertos seem anachronistically strange Russian products for that period. All the works but the Trumpet Concerto are premiere recordings. Vol. IV offers chamber and orchestral music by Mikhail F. Gnesin. Three of his sisters founded what became the Gnesin State Music College. “D’après Shelley” perpetuates the Rimsky-Korsakov and Glazunov traditions whereas The Jewish Orchestra at the Ball at Nothingtown, written as incidental music for Gogol’s Revisor, suggests a Turkish Mahler’s Klezmer band. Other pieces, a Requiem for piano quartet and a 1943 piano trio, “dedicated to the memory of our lost children,” recall Arensky and Tchaikovsky. String quartet and harp combine for the Songs of a Knight Errant and Adïgeya adds clarinet and horn to a piano quartet. Arte Nova’s Vol. I contains piano music of Mosolov (ANO 277930), Vol. III consists of music for cello and piano by Krein, Gnesin and Kirkor (ANO 390482), and Vol. V collects string quartets by Mosolov, Roslavets and Knipper (ANO 487222). Dmitri SHOSTAKOVICH: Symphony No. 1 (1925); Symphony No. 15 (1971). Mariinsky Orchestra, Valery Gergiev (cond.). 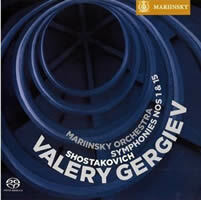 Mariinsky MAR0502 (1 SACD) (http://www.mariinskylabel.com/). Distributed in the US by Harmonia Mundi (http://www.harmoniamundi.com/). Dmitri SHOSTAKOVICH: Symphony No. 15 (1971); selections from the Hamlet, Op. 32 (1931). Russian National Orchestra, Mikhail Pletnev (cond.). Pentatone PTC 5186 331 (1 SACD) (http://www.pentatonemusic.com/). Distributed in the US by Naxos (http://www.naxos.com/). Dmitri SHOSTAKOVICH: Symphony No. 4 (1935-36). Netherlands Radio Philharmonic Orchestra, Mark Wigglesworth (cond.). BIS 1553 (1 SACD) (http://www.bis.se/). Distributed in the US by Qualiton (http://www.qualiton.com/). Dmitri SHOSTAKOVICH: Symphony No. 4 (1935-36). Chicago Symphony Orchestra, Bernard Haitink (cond.). 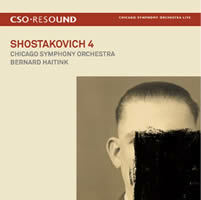 CSO-Resound CSOR 901 814 (1CD + 1DVD) (http://csosoundsandstories.org/). Despite Gergiev’s cool control and the Mariinsky Orchestra’s glowing virtuosity, these first and last Shostakovich symphonies are uncomfortably severe, the First’s insouciant humor having been bleached away. The Fifteenth is numb when it ought to be sly. Slow movements are impatiently dispatched as obstacles to speed. Gergiev coaxes surgical maneuvers from his players. Possibly he and the Mariinsky know more about Shostakovich’s psyche than others, but the overall taste is bitter. These are not performances I want to know better. Would this severity work with the Fourth? I should seek the conductor’s 2004 Philips recording. The Russian National Orchestra’s Fifteenth with Pletnev continues a series for Pentatone. The more human and varied RNO is less precise than its driven St. Petersburg colleagues. The Hamlet incidental-music selections make disappointing filler, however. It’s hard to approach the Fourth without being mindful of its significance in Shostakovich’s lineup. This was the symphony that dropped from public view and purportedly captures Shostakovich’s initial steps down a path he could not take. History would like us to think that the Fourth and Lady Macbeth of Mtsensk mark a halt and change of course. Like others, I’ve looked for patterns and read the various memoirs and biographies, trying to make sense of, and peace with, Shostakovich’s oeuvre. That said, I have never heard a huge stylistic change after Stalin’s critique of Lady Macbeth brought on Shostakovich’s personalized Terror. Perhaps Shostakovich returned to traditional forms — the Fourth does wander — and yet his pessimism and caustic dissonance remains, albeit bracketed with ironic gestures, as if to say “Let me demonstrate how I’m not being subversive.” The rejuvenating Fifth’s optimism and noisy celebration — “A Soviet Artist’s Practical Creative Reply to Just Criticism” — for this listener rings hollow. Compared to certain of his peers, it’s evident how much harsher Shostakovich’s music could be. Consider Tikhon Khrennikov’s Second (1940-42) (Mobile Fidelity MFCD 907): Despite its minor-mode angularity, in terms of orchestration, structure and motivic handling, the music isn’t all that far removed from Tchaikovsky and Glazunov. The symphony reveals neither wit nor sarcasm, nor are deep emotions on show. Perhaps Khrennikov’s oeuvre is unfamiliar in the West because we view him as Soviet music’s bad cop. As all-powerful Secretary General of the Union of Soviet Composers, a post Stalin and Zhdanov awarded him in 1948 and which he held until the USSR’s dissolution in 1991, he had a direct hand in manipulating his peers’ progress, condemning some and abandoning others. And then we’ve the prolific Nicolai Miaskovsky and his 27 numbered symphonies composed between 1908 and 1949. After such moderately avant-garde works as the 1927 Tenth, Miaskovsky tended towards a sweeping lyricism. Somewhat contemporaneous with Shostakovich’s Fourth, the F major Sixteenth, Op. 39 (1934), was written after the tragic “Maxim Gorky” airplane crash. It offers patriotic grandeur and a funeral march. No. 17, in G-sharp minor, Op. 41 (1937), suggests Grieg. Warner Music France’s 16-disc brick houses Evgeny Svetlanov’s complete Miaskovsky symphony cycle (2564 69689-8) which first appeared piecemeal on Olympia. The set’s cardboard sleeves, absence of recording dates, and skimpy biography mark it for libraries and obsessive collectors. 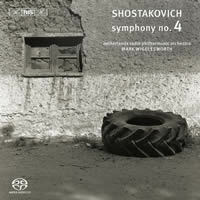 The enigmatic wind-down of Shostakovich’s Fourth would certainly have been dispiriting. I connect the Fifteenth’s conclusion with the Fourth’s, suggesting that he never quite repented his disapproved ways. I’m not bothered by the Fifteenth’s first-movement Rossini quotes. Shostakovich would seem to be providing an ironically familiar melody to the rat-a-tat rhythm he’d used for years. Similarly, the Wagner-like chords have never stood out as other than Shostakovich. Why is it no one ever tries to explain or apologize for his heavy Mahler borrowings? Wigglesworth and the NRPO’s Fourth sprints to the front of the pack. Haitink’s CSO effort is fluid but surprisingly coarse — perhaps it’s the hall’s acoustic properties. Haitink’s older London release (reissued on CD in 1989 as 421 348-2) demonstrates an apt menace, with the recent BIS coaxing more presence from the NRPO. CSO-Resound pairs the Fourth with a bonus DVD, Is Music Dangerous, in their Beyond the Score series, essentially an extended program note. Narrator Gerard McBurney and actor Nicholas Rudall provide historical context against fascinating period footage, revealing how Stalin rebuilt and terrorized his country. As informative as the nearly hour-long documentary is, I felt there was something left unsaid, almost as if censors were alive and well in The Windy City. Far more satisfying is Semyon Aranovich and Alexander Sokurov’s film Dmitri Shostakovich: Viola Sonata (1981) (Idéale Audience DVD5DS14), which in fact was banned after completion. Scenes filmed at Shostakovich’s dacha are mixed with period reels showing party rallies and bombed cities. There are several scenes featuring the composer, unknown until Sokurov unearthed them from the archives. We hear Shostakovich and Oistrakh chatting after a Violin Concerto’s premiere. Most striking is footage of the same music under different batons: a steely Mravinsky and an effusive Bernstein at the end of the Fifth’s finale.